(18 May 2016) The UN Committee on the Rights of the Child, 2016 Day of General Discussion to be held in Geneva, Switzerland on 23 September 2016 will be devoted to the theme of Children’s Rights and the Environment. 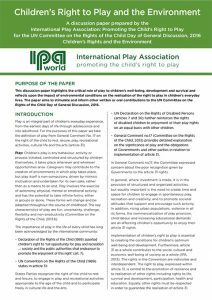 Inspired by this theme, IPA has developed a discussion paper on Children’s Right to Play and the Environment. This discussion paper highlights the critical role of play to children’s well-being, development and survival and reflects upon the impact of environmental conditions on the realisation of the right to play in children’s everyday lives. Prof. Sheridan Bartlett; Theresa Casey; Dr. Sudeshna Chatterjee; Prof. Roger Hart; Prof. John McKendrick; Robyn Monro Miller; Dr. Wendy Russell; Keith Towler.